What do experts and everyday customers say about CashNetUSA’s services? What else else should you know about CashNetUSA before utilizing their services? Find out for yourself! CashNetUSA offers payday loan services via a secure online application, with loans of up to $500 available for qualifying borrowers. Services are available to applicants in a number of states, and rates, terms, and conditions are made available upfront. 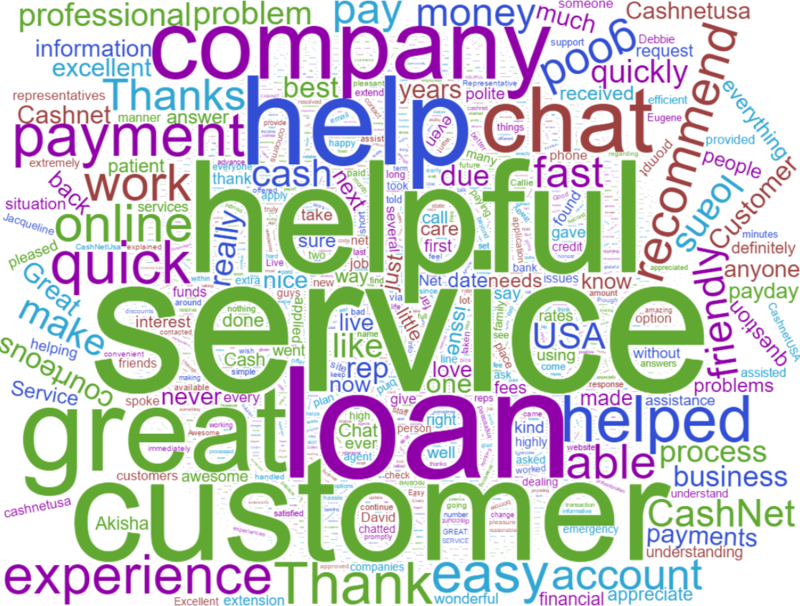 What do experts and everyday customers say about CashNetUSA’s services? What else else should you know about CashNetUSA before utilizing their services? Find out for yourself! CashNetUSA’s primary service is payday loans. These are usually short-term, low-dollar amounts that help you fill in the gap until your next paycheck. Some loans can be extended depending on where you live and vary between $100 and $1,500 based on your need and your state’s regulations. You can request a line of credit from CashNetUSA between $200 and $2,000 depending on your creditworthiness and financial need. You can even request a cash advance from your credit line for a flat transaction fee. Lines of credit can be repaid monthly, bi-monthly, or bi-weekly with preset interest fees. These are an elongated version of CashNetUSA’s traditional payday loans that can be repaid over six months on each payday. This is a medium-term installment loan that can be repaid in installments over five to 10 months. This is a short-term loan provided by one of CashNetUSA’s financial partners that gets repaid on your next payday. This is a flexible loan that gives you more options for repayment as well as spending power. You apply once and can request multiple cash advancements based on the approved credit limit. This is another short-term loan option provided by a CashNetUSA financial partner. As a CAB, CashNetUSA will try to arrange a loan for you with a third party and then manage the loan once it’s been issued. Here are some of the rates and fees you can expect to pay with CashNetUSA. Exact rates vary depending on your state, loan amount, and repayment schedule. Between 86.9 percent and 1,140.6 percent APR, plus $10 to $25 in fees for every $100 borrowed based on your location and the amount borrowed in addition to any other flat fees specific to your state. Here is a list of the minimum requirements you’ll need to meet to apply for a loan from CashNetUSA. You are not immediately qualified for approval. These are a few of the pros and cons of using CashNetUSA’s services, according to the expert and customer reviews we’ve received. According to expert financial advisors, CashNetUSA has a higher rate of qualifying new customers for its services. We found that customer reviews rated CashNetUSA’s customer service highly. CashNetUSA’s website clearly defines what it requires of applicants, and each page explains its rates and terms. Financial experts rated CashNetUSA as one of the leading payday loan lenders in the country. We discovered that loans from CashNetUSA range from a low APR of roughly 86 percent to 1,140 percent, which can make repayment difficult. Depending on where you live, CashNetUSA may not offer products in your state. Currently, 19 states in the U.S. (in addition to Washington D.C.) are not serviced by CashNetUSA. In our analysis of online reviews by former CashNetUSA customers, the company had a one-star average rating on Consumer Affairs. Many CashNetUSA customers end up paying additional fees to pay their loans on time. Higher loan amounts can be more difficult to repay given the high APR costs. The decision to take out a payday loan shouldn’t be made lightly, because it can be a costly expense. However, in your time of need, CashNetUSA is one of the biggest lenders in the country and its approval rates and flexibility mean that (as long as it offers services in your state) you’ll could able to find a solution that can help get you back on your feet. Many reviewers appreciate their customer service, so take them up on it. In recent years, scammers have targeted consumers by claiming to represent a range of companies that provide short-term loans. CashNetUSA is a primary target of these impersonation attempts – so exercise caution and ask questions of people who try to collect money or make threatening demands for payment on behalf of an organization. Someone claiming they’re collecting on a loan you never requested. If you’ve never taken a loan from CashNetUSA, get off the phone ASAP. Someone threatening a lawsuit if payment is not immediately made. Someone threatening to contact your employer. Someone requesting payment to India via a wire transfer from MoneyGram or Western Union. Never pay any fee in advance to secure a loan. Never give out personal information if you cannot verify the identity of the person contacting you or the validity of an existing debt. If the caller starts making threats of any kind, hang up the phone immediately. Once approved, funds will become available by the next business day. Applications approved from 6 p.m. CST Thursday through Sunday will have funds available on Monday. What if I can’t afford to make my payment? Depending on where you live, you might be able to file for a loan extension. Regardless, if you think you won’t have the funds available to make your payment, you should contact the lender immediately. If a debit is returned unpaid for any reason, it will immediately go into collections. You can reach out to CashNetUSA’s customer service team to see what options are available to you. If you repay your loan early, you may be entitled to receive part of your loan fees back. How long do I have to wait to apply for another loan? That varies based on where you live. You can visit CashNetUSA’s site to learn more. If you meet the minimum application requirements, the application process should take about 10 minutes. Do I need a certain credit score to apply? No. A less-than-perfect credit score will not necessarily stop you from qualifying. Even if you’ve been turned down in the past, you may still qualify for loans from CashNetUSA. Is CashNetUSA a legitimate and safe service to use? Yes, CashNetUSA is safe and legitimate. What is CashNetUSA’s policy if I pay off my loan early? There is no penalty to pay off your loan early. You can do this by logging into your online account. Who are the lenders for CashNetUSA? CashNetUSA is a direct lender. How does getting a loan from CashNetUSA affect my credit score? Getting a loan from CashNetUSA will affect your credit score the same as any other loan. Make sure you look into your loan terms so that you know you’re getting the best deal. Then, make your payments on time so that it reflects well on your credit. If you don’t make your payments, it will affect your credit score negatively. Is my information safe if I use their online services to apply for a loan? Yes, your information is safe and secured. How well did CashNetUSA meet your needs overall? How satisfied are you with CashNetUSA’s fee payment process? How secure did you feel about giving CashNetUSA your personal information? How would you rate CashNetUSA’s customer service? Loan approval process too slow or confusing. Loans can be denied after processing. Please write a few sentences to describe your experience with CashNetUSA.